Daps – For the fainthearted . . .
Ringing the doorbell, I stood back to await an answer. 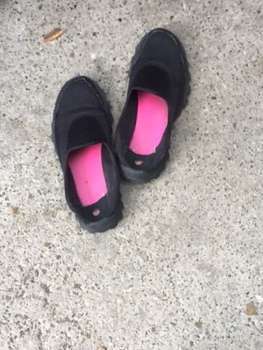 Wellington boots and outdoor shoes stood lined up in the porch, and then a pair of shoes that recalled chilling fears from childhood: daps, plimsolls, gym shoes, or gutties, in the parlance of my Belfast-born wife. There were people who had lace-up versions of such shoes, but for most of us the elasticated version was used for those activities which filled me with a sense of dread and foreboding. Black fabric and rubber soles, they provided little support for the feet of someone who always walked awkwardly. Daps were worn for physical activities, gymnastics, basketball, running; things that were approached with delight by some people, but not those of us who had no aptitude for anything that demanded speed or agility. The problem with daps was that it was not even possible to drag out the time putting them on, to pull on each took no more than a couple of seconds, and then we were expected to gather around the teacher to listen with enthusiasm to the instructions that the teacher would give. 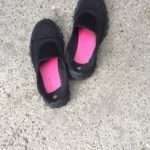 The capacity of a pair of canvas shoes to cause a feeling of unease, forty-odd years after such footwear was last worn, suggests that physical education really did instill a feeling of fear into the hearts of many of us. The worst part of PE was rarely the game itself. There was nothing inherently wrong with basketball in the school gym, or athletics on the field, or our attempts at gymnastic manouvres, the pain came with the attitude of the teachers. Those of us not good at the prescribed activities were subject to belittling and sometimes even insults. The worst treatment ever (albeit we were wearing football boots that day) came from a teacher who decided to try to teach first form boys the rudiments of rugby, despite the fact that we did not attend a rugby-playing school. One boy displayed a lack of skill in his attempt at kicking a rugby ball, something he had probably never done before in his life, when the teacher ran up from behind the boy and kicked him in the buttocks with such force that the boy was sent stumbling forward. When those charged with caring for the health of the nation complain about the high incidence of obesity among middle aged Englishmen, they might ask themselves why there is an aversion to physical activity. If a pair of daps can bring painful memories from the early-1970s for me, then how many more people had similar experiences?